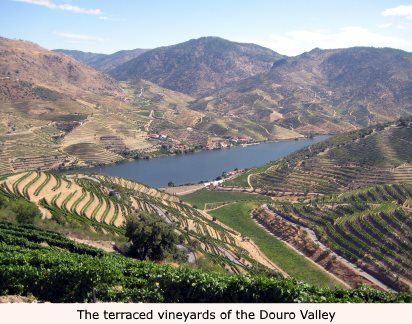 In recent years the traditional fortified Port wines of Portugal’s Douro Valley have seen some ups, but plenty of downs. All the significant Port houses havey diverted some of their vineyards and production into table wines as stricter drink driving laws, health consciousness and fewer of us hosting formal dinner parties mean that for most, finishing a meal with a glass of Port has become confined to a Christmas Day tradition. There are occasional (and perhaps sustained) surges, like a renewal of interest in age-dated tawnies and Colheita Ports (aged tawnies of a single vintage), and apparently a bit of a hipster interest in Port to mirror that seen in Sherry, but still Port is surely struggling, despite plenty of invention in the sector, from pink Ports, to Ports designed to be served over ice. One category of Port that can still cause real excitement and generate interest from collectors and drinkers, are the Vintage Ports. Vintage Ports are produced only in years of exceptional quality, normally from the very best of the crop, and are wines that are bottled relatively young, but with the promise of a great life ahead of them. 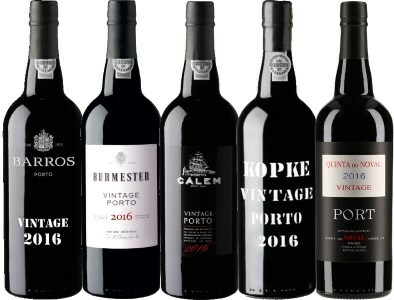 Each of the Port houses decides whether or not it will declare a vintage in a particular year, a decision largely down to the success of their specific harvest (and which needs to be approved after tasting and analysis by the Port Wine Institute). There are years when nobody declares a vintage, and others when only one or two houses will declare but most do not consider that they have the quality: 2014 was such a year, with only a handful of houses declaring. Other years are of such excellent overall quality that practically every house, large or small, can declare a vintage. 2016 is the latest of these, the first generally declared vintage since 2011. What makes 2016 so special? Well that is basically down to growing conditions with a mild, wet winter followed by a cold, wet spring that kept yields in check. The summer was hot and dry – very hot in fact, which meant that the heat-stressed vines really benefitted from some late rains to kick-start ripening. The harvest took place in ideal autumn conditions that were dry and warm, but with cool nights that resulted in fully ripe, but balanced and concentrated fruit for the majority of growers. The Ports of 2016 will spend at least a couple of years maturing in the Port lodges before being released, so expect them to physically hit retail shelves at the end of 2018 or beginning of 2019. But meanwhile I have managed to taste a handful of declared wines as bottled or late-stage cask samples. Four of the wines below come from the Sogevinus group, which comprises Cálem, Kopke, Burmester and Barros, sent to me directly from Portugal in August 2018 as cask samples (though the wines will be bottled around now). The other wine in the tasting comes from the French-owned house of Noval, a bottled sample. Price-wise, the Sogevinus wines will probabaly sell for somewhere around £50, whilst Noval might be closer to £70-£75. In the 1990s Robert Parker’s praise for Vintage Port led a whole new generation or two of drinkers, especially in the USA, to buy, open, and consume newly-released wines and enjoy ther tannic structure and bursting sweetness. That was very much a break with tradition, as Vintage Port was always regarded as one of the most cellar-worthy wines as they matured, softened and generally improved over decades. The latter is still true for all of these wines, some already drinking rather nicely whilst others are relatively ‘closed’ at this stage, but their intensity and balance gives high hopes that they will blossom further with time. You pays your money and you takes your choice. My scores are based on wines that are all but bottled and finished, but because these are pre-release samples I have perhaps been slightly more cautious with my scores than I might be, so there’s every chance these may improve by a point or two over time. These wines will be shipping over coming months. Keep an eye on wine-searcher for stockists and prices for these and many more Ports of the 2016 vintage that will appear. (2018) Touriga Franca (40%), Tinta Roriz (30%), Touriga Nacional (20%) and Tinta Barroca (10%). Opaque and dark, there's a touch of meat-stock and woodiness, then dark-roasted coffee beans on the nose, but there is lift too, with a little floral and kirsch character to follow. Extremely rich and sweet on the palate, a real depth of raisin and Maraschino cherry fruitiness, backed up by chocolate and more coffee-bean espresso. A hugely ripe and sweet young Port this, of very good quality. 92g/l of Residual Sugar. (2018) Touriga Nacional (50%) and Touriga Franca (50%), from vines more than 25 years old. Quite similar to the Barros, but with a lighter, more ashy quality to the aromatics, sappy and fresh, a touch rose-hip in an understated but attractive nose. Super-sweet and super-ripe again, but decisive, slightly higher acid character to this that gives light and precision, backed up with some tannin structure, but the very sweet berry fruit is buoyant and juicy, in quite a different style from the richer Barros. 91g/l of Residual Sugar. (2018) Touriga Nacional (50%), Old mixed vineyards over 50 years old (50%). Arguably the darkest, most saturated colour of the four Sogevinus 2016s tasted, chocolaty, dark and brooding on the nose, meat-stock and a dark berry fruit coming through. Darkly-fruited palate, a real sense of tannic grip here, drying the mouth with concentrated black fruit essence, but there is a little violetty note here too, suggesting it has more to give. Could well be the wine in this line-up to benefit most from ageing. 91g/l of residual sugar. (2018) Touriga Nacional (30%), Touriga Franca (30%), Tinta Roriz (30%) and Sousão (10%). Not as flaboyantly fruit-forward as either the Barros or Burmester at this stage, classic young vintage Port notes of blue/black fruit, tight and supple, a touch graphite and slightly inky nose. On the palate filled with smooth, sweet fruit, unruffled by tannins, a keen cherry acidity, long and sweet, raisin flavours with a bittersweet edge and cherry acids. I suspect this had considerable potential but is possibly the most closed of the Sogevinus wines at this cask sample stage. 96g/l of Residual Sugar. (2018) A blend of Touriga Nacional, Touriga Franca, Tinto Cão and Sousão foot-trodden in lagares, before spending 18 months in barrel at the quinta in the Douro. Black as pitch, the nose is at once meaty and suffused with rich, dark, chocolaty berries, a little kirsch-like lift adds to the charm, elegance and complexity. In the mouth there's a very unforced feeling of concentration, the fruit deep and creamy, but the agile, mineral acidity and rasp of firm tannin giving a juiciness and length. Like all of these 2016's, Noval needs time, but is a beauty in the making. 82g/l Residual sugar. Tom, do you know how much RS is in the Kopke? I guess price will often mean that Vintage Port is not a regular tipple for most folk. Not sure why that is, compared to the region’s table wines as VPs are released fairly early. Perhaps they just want it to hit the ‘prestige’ product market? Thanks Paul. The RS figure for Kopke was missing from the tech sheets I was sent with the wines, but I have just asked Sogevinus who say the answer is 91g/l. I’ll add that above. I see what you mean on pricing, as VPs and quality Douro table wines probably take the same amount of time and ‘effort’ to produce, yet might sell for half as much. I guess Port is a more labour intensive process and duty and possibly taxes in Portugal are higher, but maybe the grape selection is part of it too? Adrian, I’m pretty certain they are owned by Sogevinus? Are you thinking of another house – Krohn perhaps?